Is it time for a ban on artificial food dyes? 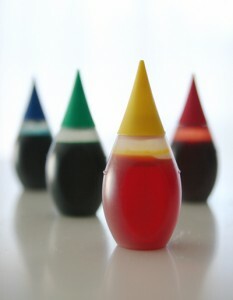 Artificial food coloring comes in bottles labeled ‘Yellow #5′ or ‘Red 40′. Natural food advocates skip that crap out of habit and know how to spot it on grocery store shelves (hint: if it looks too cheap and good to be real, it’s not). Fake colors are an easy and inexpensive way for food processors to make their products more appealing. My decision to skip artificial coloring has not been about its safety. I trust the FDA to keep an eye on common food additives and periodically assess their health risk. But who regulates the regulators? The Center for Science in the Public Interest is lobbying for the FDA to ban three common dyes: Yellow #5, Red 40, and Yellow #6. Why? CSPI says that the evidence is in the FDA’s own studies. Tests done on lab animals found contaminants that raised health concerns about several of the nine dyes currently approved for market. CSPI goes on to request stricter guidelines for FDA approval on color additives. They say that the ‘convincing evidence’ standard should be on the side of ‘convincing evidence that this is safe’ instead of ‘convincing evidence that this is harmful’. On that count, I think CSPI nails food safety. Nothing’s going to change soon, though. If you’re interested, though, check out food coloring use in other countries. In the United Kingdom, a McDonald’s stawberry shake is colored by—get this—real strawberries. Fanta’s orange soda? Pumpkins and carrot extract. U.S. versions use Red #40 and Yellow #6, respectively. You’d like to think that this is the result of American ingenuity, but it’s really just industrialized food production. Artificial coloring is cheaper than the real stuff, so manufacturers stand to make more money by throwing in some dye and calling it good. Here’s hoping the FDA takes an extended look into its own studies and the result of independent analysis. Polysorbate 80: Are you eating this mysterious ingredient? Did Breyers Just Wreck Their Ice Cream Line? What’s in McDonald’s Big Mac Sauce? Is Kobe Beef Food’s Biggest Scam? What the heck is in Budweiser and Bud Light Chelada! ?